By the start of the twentieth century, watch manufacturers had noted some demand for men's wristwatches and started producing purpose made designs. These used existing movements that had originally been designed for small pocket watches, placed into cases that had loops of wire called "wire lugs" soldered onto the sides of the case to take a leather strap. The often told story that these first purpose made men's wristwatches were converted ladies' fob watches is wrong, as I explain in a later section. The picture here shows one of these early wire lug wristwatches, and you can see how simple the fixed wire lugs that take the strap are. 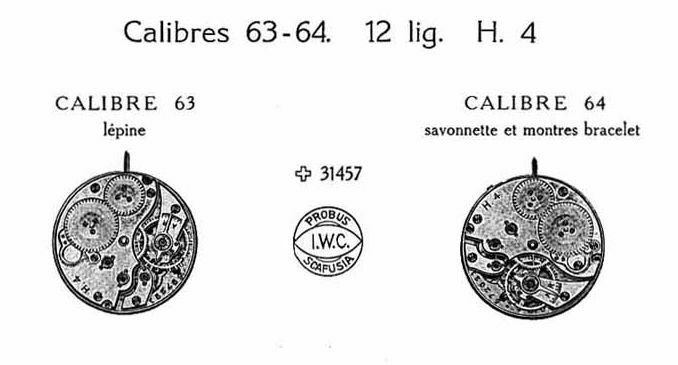 No wonder Jaquet and Chapuis poked fun at the watch manufacturers who claim to have "invented" the wristwatch. However, in 1903 Dimier Brothers did stake a claim to have invented this design, and many early wristwatches carry a stamp Déposé No. 9846 which proves that this claim was taken seriously at the time. A wristwatch like this was not made by simply soldering wire lugs onto an existing pocket watch. The basic reason for the creation of the wristwatch was to make it easy and quick to read using only one hand. That meant that it should be open faced, but an open face Lépine pocket watch normally has the seconds sub-dial at 6 o'clock and the crown at 12 o'clock, which is where the strap needs to be attached. A Lépine movement can't simply be rotated to place the crown at 3 o'clock because that would put the seconds indication at 9 o'clock. There is a story that in 1879 the German Emperor Wilhelm I visited the Berlin Trade Fair and saw some experimental wristwatches made by Girard-Perregaux and ordered 1,000 of these for the German Imperial Navy Because of this story Girard-Perregaux are sometimes said to be the first manufacturers of wristwatches in significant volume. The picture that usually accompanies this story can't be one of the German Navy watches because it has dial with luminous paint on the hands and numbers. The first luminous paints used on watch dials were based on radium, which was discovered in 1898 by the Curies. Unfortunately, nothing is known about these wristwatches apart from the story. The archives of Girard-Perregaux were partially lost, there are no records of such a watch being exhibited at the Berlin Trade Fair or being used by the German Navy, and there are no pictures of anyone wearing one. Over the years there have been many attempts to locate one of these watches, or other evidence for their existence, but none has been forthcoming. This is surprising if there really were thousands produced and, in the absence of any evidence, most serious researchers now believe that the story isn't factual. To create a true wristwatch like the one shown here, a savonnette movement, which would normally be used in a savonnette (hunter) case with a lid over the glass, has been put into a Lépine (open faced) case. This correctly places the winding crown at 3 o'clock and seconds sub-dial at 6 o'clock. The case has been made slightly differently too, there is no long pendant tube for the bow and securing Albert chain. These were not complicated modifications for a manufacturer to bring together, but certainly not as simple as just soldering wire lugs onto an existing pocket watch. I touch on this further below, and explain it in more detail on my page about watch cases. Although these early wristwatches were taken up in small numbers by automobilists and aviators in addition to military men, they didn't find favour with the general public. They were regarded as too small to keep accurate time, too vulnerable to damage or dust and water, and simply not the fashionable thing for men to wear. In fact, even when purpose made wristwatches were available, the leather wristlets that allowed a pocket watch to be worn on the wrist continued to sell in large numbers. This all changed during the Great War (the First World War, WW1, of 1914 — 1918) when large numbers of men entered the armed forces and, in the trenches of the battlefields, they saw experienced and battle hardened officers wearing and using wristwatches. This changed the perception of wristwatches being effeminate, and many men wanted to own one themselves. As a result this early style of wristwatch with wire lugs became known as an "officer's watch", or more commonly a "trench watch". The Swiss watch industry benefited most from the new demand for wristwatches. English manufacturers had largely left the market for small watches to the Swiss and were not prepared with suitable size movements that could be produced in the large numbers required. American watchmakers were better prepared with small size movements. Waltham sold a lot of wristwatches in Britain during the war, as did Elgin did to a smaller extent. Back home in America though things were different. The US stayed out of the war until 1917 and the number of men who served in the war in Europe was a much smaller proportion of the American population than those from the European countries. Consequently the returning soldiers did not have the same impact on social norms in American and the wristwatch remained an unfashionable item in America into the 1920s. English watchmakers were well behind the curve when it came to making small movements suitable for wristwatches. The hand craft methods used in England were not easily capable of producing the smaller size movements needed for lady's pocket/fob watches, which were the ideal size for wristwatches. The English makers largely left the production of smaller sized movements and hence that part of the market to the Swiss, who had invested in machinery and modernised their watch production after a scare in 1876 when they found out at the Philadelphia International Exposition what the Americans were capable of doing with mechanised production, although only a few Swiss companies brought production completely into one integrated operation, Longines being one. Machinery was better adapted than hand craft methods to making the smaller components needed for wristwatch sized movements, but it required a big financial investment in special purpose machines. The English watch industry was fragmented into many small companies and had been declining for many years and, with a few notable exceptions, English watch manufacturers simply did not have the organisation or capital to invest in integrated and highly mechanised factories. The Swiss however were better organised and adopted some aspects of the American methods of manufacture and successfully fought back and retained a large share of the market. Consequently when the demand for wristwatches suddenly took off in the Great War, English manufacturers were unable to fulfil it and the Swiss and Americans swept the board. The one relatively large English manufacturer that could perhaps have competed with the Swiss and Americans for a slice of this market, Rotherhams of Coventry who had mechanised in the 1880s, were out of the watch trade during the war, instead manufacturing fuses for shells and other war material. The very first watch that I serviced on a training course at the BHI was a pocket watch; not a particularly large one, but when I worked on my first wristwatch I was amazed at how much harder it was due to the difference in size and scale, and this helped me to understand what the English craft manufacturers came up against. Only Rotherhams were capable of producing wristwatch sized movements at a price that could come anywhere near the price of Swiss watches, although still considerably more expensive. 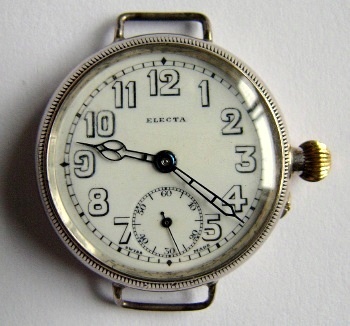 English manufactured men's wristwatches from before WW2 were expensive when new and are RARE. The company of E. J. Pearson and Sons, harness makers and saddlers at 275 and 277 St. John Street, London, had a long history, tracing their roots back to 1804. The company was taken over by Edward John Pearson in the 1880s. His sons Edward John junior and Alfred Edward also worked for the business. Mr. Tucker, managing director of the firm of H. Williamson Ltd., had an interesting claim about the origin of the wrist watch. He told an interviewer: ‘During the Boer War we received a 12 size watch belonging to an officer in South Africa. He said he wanted to wear it on his wrist. I suggested putting loops on the case and sewing straps on to them. This was done, and we were struck with the idea and had it registered. It was some time before the idea took on, but eventually it became extremely popular.’ Pearsons made the wrist strap to Mr. Tucker's order. In August 1908 E. J. Pearson and Sons registered two designs of watch straps with the British Board of Trade. The purpose of registering a design was to provide protection for the "intellectual property" of the originator of the decorative or artistic elements of a design, preventing these from being copied or manufactured without permission. A registered design was given a unique number and this was usually marked on the articles and in adverts, often abbreviated as "Reg. Des." or just "RD". The sponsor's mark P&Ss for Pearson & Sons was first entered at the London Assay Office by Alfred Edward Pearson on 3 November 1908 with two registered punches. The coincidence of this registration at the assay office and the design being registered at the Board of Trade is interesting. It seems likely that watch straps were the first items that Pearsons had produced that needed gold or silver buckles and that this was the reason for creating the Pearson sponsor's mark. Two more punches were registered on 8 February 1909, a further two punches on 18 June 1910, and a final pair of punches on 26 February 1914. The coincidence of Pearson registering two designs of watch straps in August 1908 and entering a sponsor's mark at the London Assay Office in November 1908 makes me think that these events marked the start of E J Pearson and Son making wristwatch straps on a commercial scale. They became the largest manufacturer of wristwatch straps in Britain. On 27 August 1908 Pearsons registered with the British Board of Trade a design for a leather wristwatch wrist strap. The Registered Design number was 529337. These straps are sometimes seen with "Reg No"" stamped in the middle of the back of the flared section, with "SIMPLEX" in a curve above and the number 529337 below. 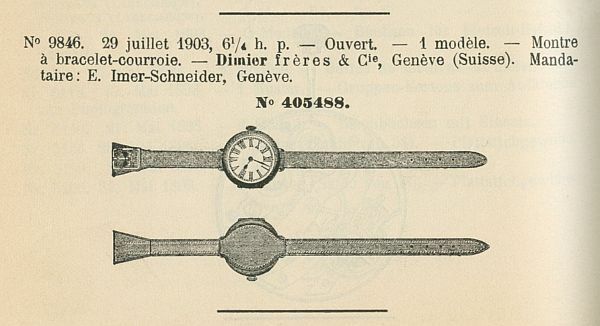 The design of the Pearson 529337 strap was identical in plan view to the design registered in Switzerland in 1903 by Dimier Brothers as Modèle Déposé 9846. Both designs had the centre section beneath the watch case flaring out into a circle the same size as the watch. 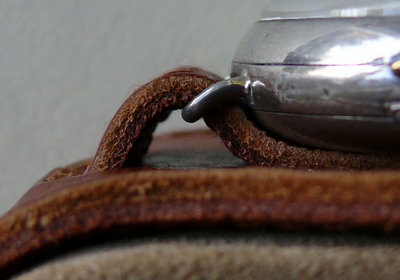 The benefit of the Pearson design was that the flared section was a separate piece of leather, underneath a separate strap that passed through the wire lugs of the watch. This meant that, unlike the Dimier Brothers design, the Pearson strap did not need to have the buckle stitched in after the strap was fitted to the watch. The Pearson strap could be easily put on to and taken off a watch by anyone without needing any special tools or a sewing kit. Even a modern strap attached to the watch by spring bars is nothing like as easy to put on or take off. In the Pearson design the flared section was stitched to the strap at the buckle end. The opposite end of the flared section had a loop attached to it that the fixed width strap was passed through to hold the two pieces together. This is quite clearly seen in the image reproduced here from the Board of Trade archives, the flared section is labelled "a". The parallel sided strap "b" passes through the loop stitched to the lower end of part "a". The Pearson design looks so much like an improved version of the Dimier Brothers registered design that it seems most likely that there was collaboration between the two companies. 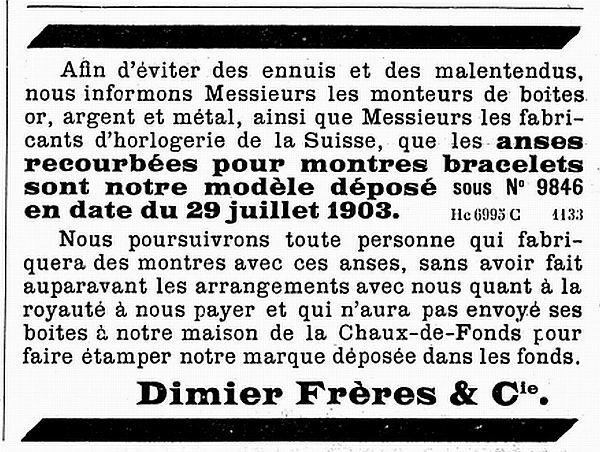 Beginning in 1912 adverts like the one here started appearing in the Swiss watch trade paper La Fédération Horlogère suisse. 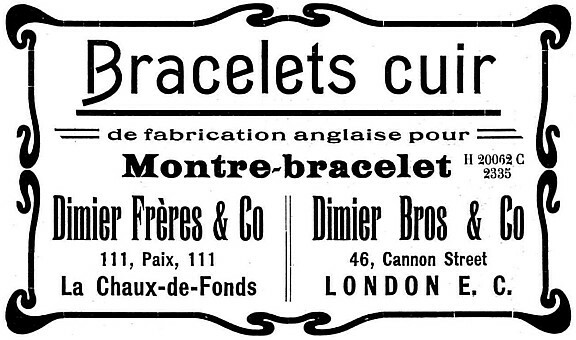 The advert was placed by the Dimier Brothers company and is for leather bracelets (bracelets cuir) of English manufacture (fabrication anglaise) for wrist watches (montre-bracelet). Although the manufacturer of the straps is not mentioned, it seems most likely that Dimier Brothers approached Pearson to make straps for them in Britain, and that when Pearson saw the Dimier design with the flared centre they soon came up with the alternative design that could be fitted to a watch with the buckle already attached to the strap. It also seems very likely that it was straps made by Pearson that Dimier Brothers were selling through their office in Switzerland. Pearson were known in the 1920s as the largest maker of wristwatch straps in England . Some of their trade mark names for watch straps were "Victor", "Simplex", "Climax" and "Premier", and the brand name "Pearmak" was widely used. Pearson Victor straps usually carry a Registered Design number, 529336. This shows that the design was registered with the British Board of Trade on 27 August 1908, the same date as the RD 529337 design with the flared centre section. I have obtained a copy of the Victor strap Registered Design specification, but it is not reproduced here for copyright reasons. The Victor strap is identical to the RD 529337 and Dimier designs, except that the under strap is not flared, it is straight sided and the same width as the main top strap. The image here shows a very old and battered leather watch strap that is stamped on the back "VICTOR 529336" and "Made in England". It is immediately apparent that the design, with its under part and loop, is the same as the British military G10 strap. In 1908 when the Victor design was registered, the British War Department did not issue wristwatches so there was no official demand for wristwatches, although the utility of wristwatches when on military manoeuvres had long been recognised. British officers were expected to purchase their own wristwatches. The first trials of official issue wristwatches were conducted by the British Army in 1917. For many years Pearsons had been the largest manufacturer of watch straps in Britain and would have been the supplier of choice for the British military when wristwatches were officially issued. Pearson would have supplied their own special design of strap, the Victor, and been delighted to see it adopted as a military standard. I have no doubt that this is how the G10 design came about, a development of the earlier Dimier Brother's design. Until I realised this I always wondered why the "under" part of the G10 was there. The company of E. J. Pearson was named after Edward John Pearson, who was followed into the trade by his son Alfred Edward. When Alfred died in 1966 at the age of 92, the notice shown here was published in the "Latest Wills" section of The Times. It says that Alfred "invented the watch strap as it is known and used now". When I first heard of this I thought that the claim was that Alfred invented the watch strap per se, but the qualification as it is known and used now must be significant. Watch straps as worn in 1966 were very different from the first watch straps used on wire lug wristwatches, so Pearson, who became a large manufacturer of wristwatch straps under the Pearmak brand amongst others, must have introduced some feature that was regarded as significant. 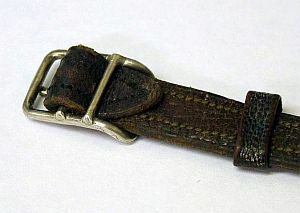 The only strap design that was still in use in 1960 and could trace its unique design and history right back to the beginnings of the man's wristwatch is the Pearson Registered Design 529336, the strap that became the G10. The G10 was still being worn in 1966, as it is today, and it seems likely that this is what "the watch strap known and used now" refers to, the strap we now call the G10 or NATO. I have a watch strap stamped Pearmak with a silver coloured buckle that has the P&Ss sponsor's mark stamped on it, although it is not hallmarked so is not actually silver. 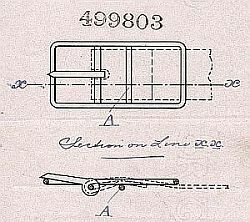 It is also stamped Patent number 368861, which was granted to Alfred Edward Pearson of E J Pearson and Sons Ltd on 17 March 1932 with a priority date of 21 August 1931 for an "Improved means for attaching straps to wristlet watches". The address on the patent was Richbell Works, Emerald Street, Theobald's Road, London. The design described in the patent was an open ended watch strap that incorporated a thin metal plate in the open ends of the strap. 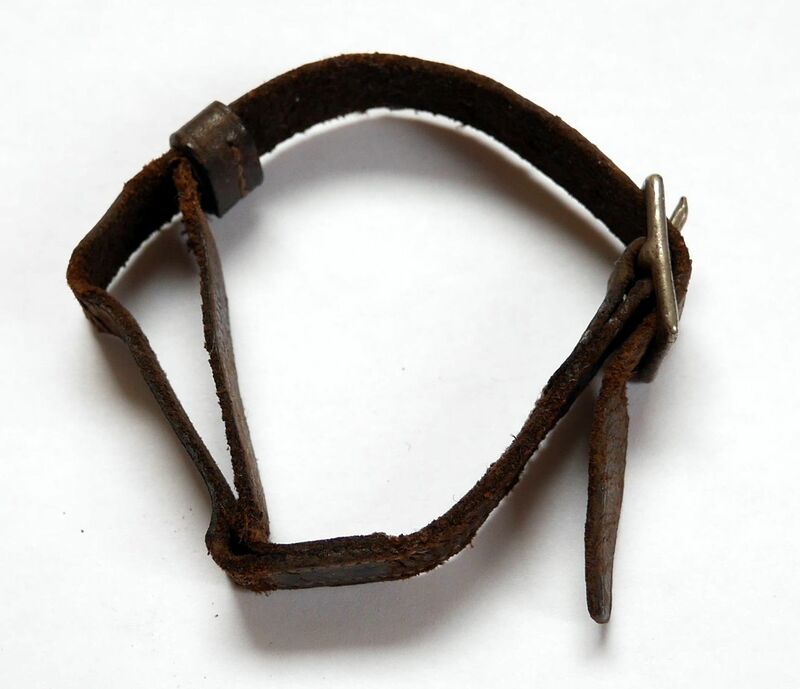 The metal plate was curved to fit around the watch lugs or bars and thus made the fastening stronger. A number of companies were producing men's as well lady's wristwatches in the first decade of the twentieth century, or at least had them available in their range, and had perhaps made the odd one or two to special request. However, the vast majority of the wristwatches that were actually sold, as opposed to just being available in the manufacturer's catalogue, were ladies wristwatches. The idea of a man wearing a watch on his wrist was gradually gaining acceptance with military men, sportsmen and automobilists, but not with the wider public. 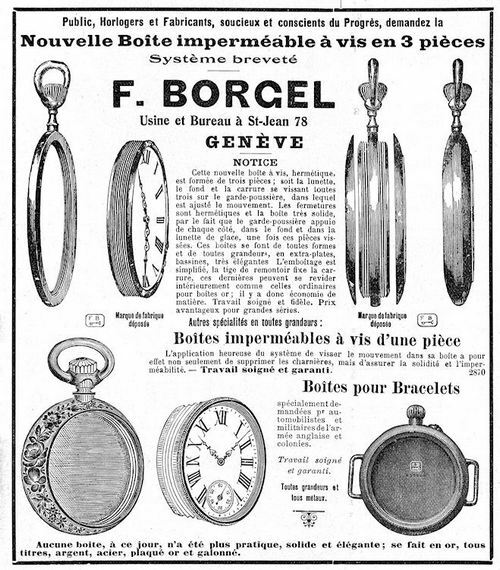 The advert shown here appeared in a 1912 issue of Revue Internationale de l'Horlogerie. The cases illustrated at the bottom of the advert are Borgel one piece screw cases, the same as the ones in the 1901 Goldsmiths catalogue discussed on the previous page. But there is also a new twist: unlike the pocket watch in the Goldsmiths advert which was strapped to the wrist in a purpose made leather strap, the case at the bottom right of the advert has been adapted with wire lugs to take a "bracelet" and be worn as a wristwatch! The advert goes on to say that this wristwatch case has been "specifically requested by motorists and members of the English and colonial army." So by 1912 watch manufacturers were beginning to wake up to the idea that for certain activities men, and military men in particular, were starting to wear wristwatches. The earliest known Borgel wristwatch like the one in the advert has been dated by IWC factory records to manufacture in late 1906 and delivery to Stauffer & Co. in London in January 1907. It was sent as a single watch rather than in a batch of six or twelve as IWC watches were usually sent to Stauffer, perhaps indicating that it was a sample or special order. Even by 1912 and the time of this advert, man's wristwatches were still a long way from public acceptance and fashionability. 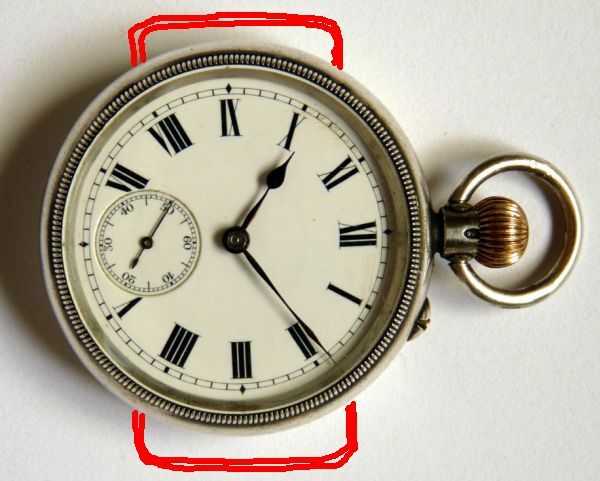 There was still the general view that a watch worn on the wrist, being necessarily smaller than a pocket watch, and subject to being more generally knocked about, exposed to dust, water from hand washing etc. would never be able to keep accurate time, and it was still perceived by some as unmanly. Two things now conspired to bring about a more rapid change in the fortunes of the wristwatch: the commitment of one Hans Wilsdorf; and the occurrence of the first World War. Hans Wilsdorf, with financial help from his brother-in-law Alfred Davis, founded the watch importing and distribution firm of Wilsdorf & Davis in London in 1905. Wilsdorf was convinced that the wristwatch was the way of the future, and soon contracted the firm of Hermann Aegler to manufacture wristwatchs for him. Wilsdorf was a perfectionist, and never ceased pressing Aegler to improve the timekeeping of the watches they made for him, which he now insisted be branded "Rolex" - a name Wilsdorf had invented. In 1910 Aegler submitted a Rolex wristwatch to the Bienne testing station. It received a First Class certificate and thus became the first wristwatch to be officially certified as a chronometer in Switzerland. On July 15th 1914, a Rolex wristwatch received a Class A precision certificate from the Kew Observatory in Greenwich, which had previously only been achieved by marine chronometers. Wilsdorf remarked that this was a "red letter day" in the development of his firm, which he would never forget. The ability of a wristwatch to maintain accurate time keeping could no longer be be held in any doubt. You can read more about Hans Wilsdorf and the Rolex story on my Rolex page. In the summer of 1914 a series of political errors and blunders plunged the continent of Europe, and indeed the whole world, into a conflict that became known as the Great War. Millions of young men enlisted or were called up for military service, many of them leaving their provincial towns and rural villages for the first time. Amongst many new things and ideas that they encountered was the wristwatch. Although wristwatches had been worn by military men for may years, this was the first time that a large section of the civilian population had seen men wearing watches on their wrists. And not just any men, but professional soldiers and battle hardened veterans from the Western front and other theatres of war. It also helped that most of the watches worn by officers had dials that could be read in the dark thanks to radium based luminous paint applied to the hands and dials. This glowed all the time with a bright unearthly light, much brighter and more constant than modern luminous paints, which in an era before the widespread availability of electric light impressed everyone that saw it. The idea that wearing a wristwatch might be a bit girly or effeminate evaporated and every man wanted one of these new leading edge gadgets. Read on for the next chapter in the story on my page about trench watches.